The 44-year old, Suchi Mukherjee has successfully brought her dream to life. She is presently the proud founder of LimeRoad.com – a portal that targets the love women audience is a fun and exciting way to discover, share and shop lifestyle products! Suchi has reached the greater heights in her love life as well. Here are the unknown shades of Suchi Mukherjee’s love life with her long-term boyfriend and present husband Sandeep Kunte, Director (Treasury) with Barclays Bank. Suchi Mukherjee an Economics graduate from St. Stephens College and M.Sc. from London School Of Economics. Founder and CEO of Limeroad from 2012. Also Read:12 Ways to make sure you never get FRIENDZONED !! Suchi Mukherjee was called to New Delhi for an internship as a lecturer at St. Stephens College. It was then that witnessed the first face-to-face encounter of her with her future husband Sandeep Kunte and support for a brief meeting. The conversation started with professional talks to the common question of how much you miss India? Both replied at a time “A lot”. Both were in New Delhi that being ‘High Techies’ ultimately were attracted to each other and did a cross Atlantic dating for a short span of time. As fate has it everything comes to an end, so, this friendship as well. It was time for Suchi to return to London and Sandeep to Boston. Both exchanged numbers and it was a sad goodbye. As fate has different plans for both of them, while Sandeep came to London for some of his bank commitments he was working in. Now, it was time for the ‘separated lovers’ to meet who didn’t even knew that actually, they have fallen in love. Both realized it was neither her time nor his time but their time to live, it was time for love. A proposal never happened so, a marriage was never discussed as it was imminent. With the blessings of their families, they tied a knot in 2006. As unity need sacrifice. Usually, women are the expected ones and they need to shift to their husband’s place. But in this unique love story, it wasn’t Suchi but Sandeep who decided to move to London as Sandeep was in Boston, U.S back then. Suchi worked in Lehman Brothers in July 1998, in 2003 for Virgin Media and then eBay, she still felt that she wasn’t justifying her ambitions. The idea to launch such a platform dawned on her during her second maternity break, when she lived in London. But the journey towards building something transformational was a bumpy ride. 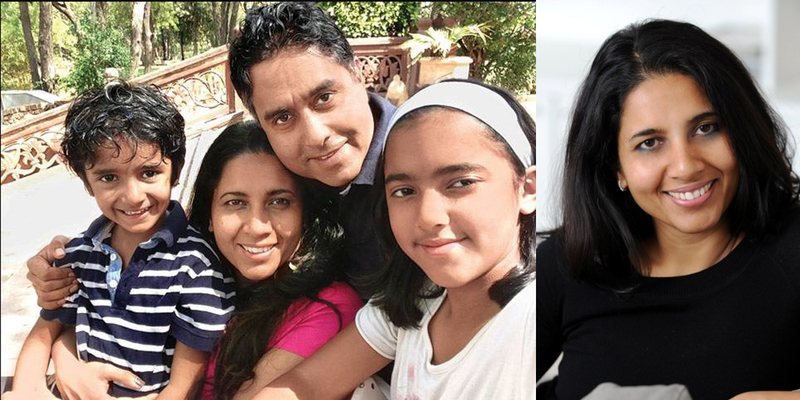 Suchi’s decision to come back to India did shake up her otherwise stable family life in London. Their son was less than a year old and Suchi ended up travelling to India every month for 15 days, while her husband and daughter stayed back in London. Suchi when was reluctant for a startup then. Sandeep told that ‘every person should take some time out of the thing that he/she likes to do the most’. Once there was clarity and conviction, it didn’t take long for Suchi to pack her bags and make her way to her homeland. She returned to India in 2011, with a vision of creating a global brand in the country. Though the family stayed apart, they stood by each other. Suchi acknowledges admitting that she couldn’t have done much without the unconditional support of her loved husband. Work balance, family, and entrepreneurship are hard. No questions about that. Sandeep was the first and the best fund and sponsor for Suchi’s startup and giving her ideas and selecting talented workers. ” I am grateful to have an extremely supportive man like Sandeep in my life. He helps to ignore the many things I am sure I miss trying to be the entrepreneur, mother, wife, all at the same time,” recalls Suchi. As Sandeep is not only Suchi’s inspiration but a source of energy who keep her amped up always. Rather than fantasizing about her dream, Mukherjee is living it. The couple trades off putting their children to bed, with spending time with them in the morning and dropping them to school. With her husband by her side in presence of her daughter Myra, 11, and son Aadit, who is five in a house in Haryana which is so filled with love. Previous article8 Signs To Know it’s Love or Infatuation? A boy who loves to explore but still lives in fairytales. Someone with whom you can talk for hours.